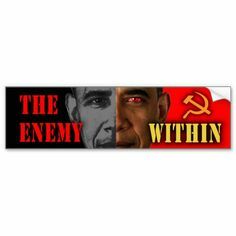 My signature graphic - "The enemy within . . ." has been with me for quite some time now. I think I'll keep it around until Inauguration Day (since obviously Barry Soetoro can still do damage until that time) but I'm open to suggestions as to one to replace it. Still processing last night - the absolute best election night I've ever experienced (surpassing the 1994 midterms and even 1980). Do you think he'll pardon Hillary? Oh yeah - on his way out the door. Wouldn't surprise me at all. Breathing a sigh of relief.......was on pins and needles last night to be sure. I am still 100% absolutely convinced the wikiwitch had a massive steal the vote scheme in place and it is only by the grace of God that the "monster" vote outnumbered the fraudulent votes or we would not be quite so happy this morning. We must never ever be so complacent again, we came too close to the edge of the cliff and its still not done. We won a battle we did not yet win a war. The GOPe is still entrenched and so are the left - globalists all and I am sure they are not done fighting. We must persevere on and never give up and above all - DON'T LET THE MAIN MEDIA OUTLETS SWAY YOU ON ANYTHING - THEY LIE! Ditto. I started seeing reports about machines not allowing the voter to select Trump, of machines changing Trump vote to Clinton. of voter intimidation in Philly.. I saw the video of Obama encouraging illegals to vote. The one ray of hope Tuesday was the massive turnout and the fact that many were intimidated from expressing support for Trump in public.